Don't Reveal Only Saraki & Dogara's Salaries... What of Buhari & Osinbajo? 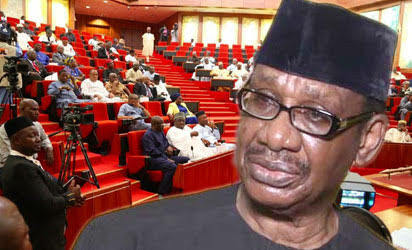 Presidential Advisory Committee on Anti-Corruption (PACAC) Chairman, Prof. Itse Sagay has been urged to include the salaries and allowances of President Muhammadu Buhari and Vice President Yemi Osinbajo whenever he carries out his threat to reveal the running cost of National Assembly leaders. Former presidential spokesman Dr. Doyin Okupe, who challenged the Prof. Sagay to unveil the details of the lawmakers’ pay within 24 hours, said such revelation should be extended to ministers, special advisers to the President and other top government functionaries, including himself. In a statement yesterday in Abuja, Okupe said any further delay in carrying out the threat would adversely affect Sagay’s credibility. The statement reads: “I find the threat by Prof. Sagay on allowances and running cost of the leadership of the National Assembly very interesting. It will aid our fight for transparency in public affairs. The one-time presidential spokesman said since salaries, allowances and running costs come from the same public coffers, laying the cards bare on the table for all to see will benefit the system. He advised the professor of Law to always weigh the possible consequences of his utterances in order not to heat up the polity, especially “at a volatile and tensed period as we have now in the country”. Okupe challenged the Senior Advocate of Nigeria (SAN) to list PACAC’s achievements for the public to see. He urged the committee to reverse the Corruption Perception Index (CPI) rating recently released by Transparency International (TI). “Sagay should sit down with members of his committee to work seriously in developing position papers and policies that will actually help the anti-corruption war and make it more effective,” Okupe advised.